Radica Software is a tech company based in Ipoh that specialises in creating software to help engineers shorten the time spent on projects. Their software is currently used by global corporations such as Apple, SpaceX, and NASA who use it to design control systems for ships, planes, trains, cars, and even rockets. In the peaceful township of Ipoh, a startup called Radica Software has been making waves on a global scale with their software programmes. Their software programmes are used worldwide by large corporations like Apple, SpaceX, NASA, and plenty more. Established in 2005 by electrical engineer Thomas Yip, and accountant Marcus Woo, the duo now form the core team behind Radica Software. Speaking to Thomas who is also CEO, he mentioned that in the beginning he created software for internal usage so that they could automate the creation of electrical diagrams, but soon found that there was a large market for such software. The beginning wasn’t easy as their first sales came from Mexico and USA, and because of their limited resources they had to borrow a laser printer to print their user manual. Furthermore, their packaging was also delayed for five days after the first sale was registered. Not wanting to disappoint their first customers, they went to the printing factory in the middle of the night to ensure the packaging was done so that it could be sent the next morning. “This attention to detail and high-quality, plus having excellent customer service has continued to be our core values here in Radica until this date,” Thomas said. Engineers all over the world are required to design complex electrical systems that control machines, cars, ships, planes, trains, and even rockets on a daily basis. However these designs, must conform to international safety and efficiency standards, and the entire process is convoluted and time-consuming. 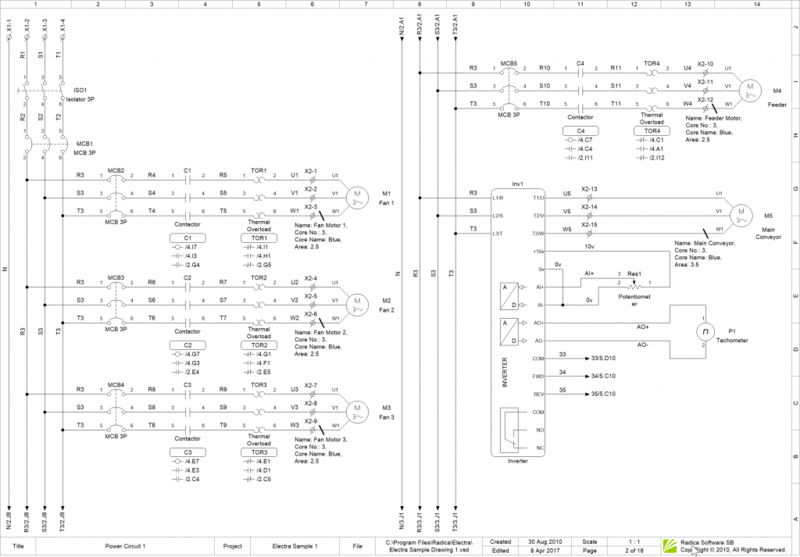 He took an example pictured above of a drawing for a circuit and explained that a typical project would require at least 50 pages of something similar, while some projects may require hundreds of pages. Hence, the first software that they’ve developed called Electra is meant to reduce the time consumed by automating most of the circuit creations processes, enabling the engineer to complete the circuit 3 to 5 times faster. Thanks to the automation process, engineers can then concentrate on safety and design rather than drafting. In addition, upon completion of the circuit, an engineer can produce reports with just a single click instead of typing manually using a spreadsheet. Just to name a few of the customers who use Electra: Apple, NASA, Petronas, and even Elon Musk’s Space X. A look at some of the global companies using Electra. Electra is used for a large range of projects, including designing machines to make peanut butter, control systems for ships, planes, trains, ambulances and cars, to make farm machinery, rockets, simulators, medical devices, laboratory equipment, and many more. Locally, Electra is also used to design machinery that prints money, specifically our RM100 bills. 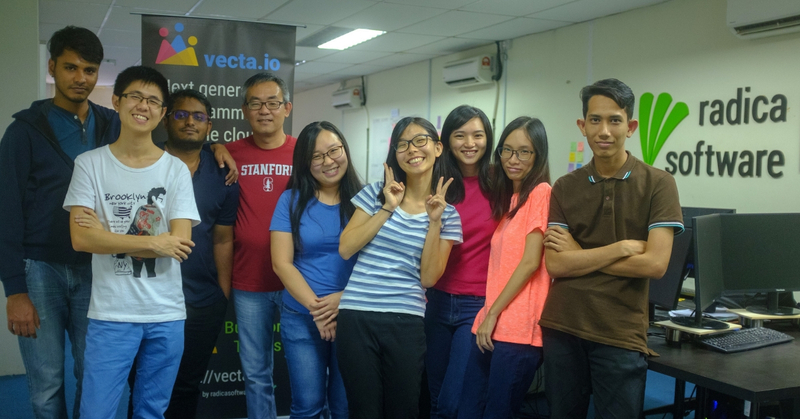 Other than Electra, they also have other software such as Vecta, a cloud-based team diagramming editor that lets members collaborate in real-time on a drawing. He puts it simply as a Google Docs but for drawing. One of the highest cost for any website worldwide is the storage and bandwidth required to deliver images. And especially with the proliferation of mobile devices, website owners are now scrambling to deliver high-resolution images to these high resolution devices. This is where Nano comes in as a large portion of these images can be replaced by scalable vector graphics (SVG) which is a worldwide standard supported by all major browsers. Radica Software was established with less than RM10,000 and only after a while co-founder Marcus became their angel investor and invested RM20,000. Thomas hinted that revenues have exceeded 7 figures and they’ve been doubling their revenue every three years. He attributes these numbers to the Coach & Grow Programme (CGP) organised by Cradle. Although currently based in Ipoh, they—unknown to most—actually started out in Kuala Lumpur and had an office there, but once they realised that most of their customers are global companies, they decided to shift to Ipoh. He mentioned that in Ipoh, the whole team can enjoy better quality of life as there are no traffic jams and there are less distractions. “That’s especially so in the connected world of today, with the prevalence of cloud computing, technology is available in every corner of the world where we can readily compete based on creativity and innovation,” he explained. According to Thomas, the secret behind how a small Ipoh-based company can reach out to global brands such as Apple is simply creating a compelling product that speaks for itself. They are also the first to do away with software maintenance contracts, and to offer customers a “no hidden fees” pricing. They’re so confident of their product, that they dare to offer a 30 day no-questions-asked warranty, claiming to be the first to offer such a thing in the industry. Priotising their customers has also been part and parcel of the company and Thomas mentioned that their post sales customer support is the best in the industry. “Customers first, has been our culture for a very long time, and everything that goes out our door must have the highest global standards and we intend to continue that for very long time to come,” he said. If you would like to find out more about Radica Software, you can check out their website here and social media here.